With the possible exception of The Neverending Story, 1984’s Friday the 13th - The Final Chapter might stand as the most deceptive movie title ever. I don’t think it qualifies as a spoiler to reveal that the series kept going long after the conclusion of this flick. Including 2003’s Freddy Vs. Jason, we’ve seen seven more Friday offerings after this fourth one. As long as profits remain to be earned, Jason will continue to kill. Whereas Part 2 and Part 3 each opened with the conclusion of their respective predecessors, Final launches with a general recap. It reintroduces the legend of Jason (Ted White) and sets the stage for more gore. The flick then picks up right where Part 3 ended, as we see authorities clean up the mess Jason made. The film also shows the apparent demise of Mr. Voorhees, as the coroners cart off his body. To the shock of absolutely no one, reports of Jason’s death are premature, and he again starts a killing spree. Abruptly, the film cuts to a local family that includes Mrs. Jarvis (Joan Freeman), teen daughter Trish (Kimberly Beck) and young son Tommy (Corey Feldman). We hear that the house next door has been rented by a group of six young adults. Lots of attractive young people out in the middle of nowhere with Jason on the loose - no points if you figure out what will happen from there. We watch the usual exposition in which the various characters hang out and engage in frivolous sexual activities. Jason stalks the woods and slowly offs more and more of the characters as we head inexorably toward yet another climactic showdown. Blah blah blah. Why do I get the feeling I could just reiterate the same review for each Friday movie and it wouldn’t matter? That’s not fair, I suppose; since I still have four more movies to go after The Final Chapter, I don’t know what potential surprises may arise. So far, however, the Friday movies have stayed very close to the same template. Any story differences among the first four flicks remain minor. Someone kills young adults out in the woods - that’s about it. Most of the characters look and act the same from movie to movie, so the main changes come from the nature of the killings. I expect that’s why Friday fans continue to flock to the flicks. They want to see new and more creative ways for Jason to slay the same cast over and over, and Final Chapter definitely expands his repertoire. This film makes his attacks more graphic and brutal than ever, so I suppose that adds to the film’s appeal for fans. Otherwise, you won’t find much new in Final Chapter. It introduces a family to the concept; we still have lots of anonymous, horny young adults, but we also get young Tommy and his mother. Not that their presence does anything to alter the normal dynamic; the twist fails to add up to something fresh, though it does mean the film’s ending presents a moderately different take on things. One change comes from the identity of the director. Steve Miner helmed the last two flicks, but here Joseph Zito takes over for him. Don’t expect this to make any difference, as the movie remains clumsily paced and put together. The films always telegraphed scary moments, and that continues here, as Zito makes sure we see the jumps and jolts come at us from a mile away. Another unintentional difference revolves around the cast. For the first time since Kevin Bacon’s turn in the first movie, we see actors who became semi-famous after the flick in question. Actually, Final Chapter offers two such performers: Crispin Glover and Corey Feldman. I never thought much of the latter, but Glover manages to bring a little quirky energy to his role. Given the amateurish nature of most Friday performances, this makes a minor difference here. But not much of one, I’m afraid. Friday the 13th - The Final Chapter does little more than reiterate the same tired story in the same tired way. It attempts some minor twists but fails to make them stick. It may satisfy fans of the series who desire to see ever more graphic slaughter, but otherwise it fails to demonstrate any form of inspiration. Friday the 13th - The Final Chapter appears in an aspect ratio of approximately 1.85:1 on this single-sided, double-layered DVD; the image has been enhanced for 16X9 televisions. The Final Chapter presented a fairly ordinary picture but not a bad one. Across the board, sharpness came across as adequate and that was about it. The movie rarely looked substantially ill-defined, but it also failed to present great delineation. The image appeared acceptably concise with a small current of softness that ran through the whole thing. As with its predecessors, no issues with jagged edges or moiré effects occurred, and only minor edge enhancement manifested itself. Also like the prior flicks, print flaws created inconsistent distractions. A smattering of strongly grainy shots appeared, and occasional bouts of specks, blotches and marks marred the presentation. In keeping with the first three movies, these seemed more prevalent during the early parts of the flick; they popped up during later portions, but not as heavily. One area in which Final Chapter marked a decline from its predecessors related to colors. The hues of the earlier flicks often looked great, but the tones here came across as decidedly more ordinary. They occasionally mustered some lively images, but the colors usually appeared moderately flat and dull. While they never became tremendously bland, they also lacked substantial vivacity. Black levels seemed passable but somewhat drab, and shadows tended to appear a bit too dense and heavy. Ultimately, The Final Chapter offered a mediocre but watchable image. Although the picture of Friday the 13th -The Final Chapter marked a downturn from the first three movies, the flick’s monaural soundtrack was very comparable to those offerings. Once again, we got a mix with no real flaws but also without any true strengths. Speech came across as reasonably natural and distinctive, but without much life or verve. Music sounded clean and bright, although the score also lacked much depth or range. Effects fell into the same category. They never turned shrill or distorted, but they failed to present elements that appeared lively or powerful. Another ordinary mono mix, the audio of Final Chapter was acceptable and that was it. 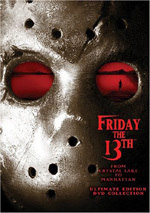 This version of Friday the 13th - The Final Chapter comes as part of a package entitled From Crystal Lake to Manhattan - Ultimate Edition DVD Collection. It gathers the first eight Friday flicks onto four discs and adds a fifth platter of supplements. Four of the flicks include commentaries that I’ll discuss when I get to those movies. Since Paramount designed the set as a connected package, I didn’t give the individual discs grades for supplements; I’ll reserve those for an overall review of the fifth DVD. A film that totally failed to fulfill its title’s promise, Friday the 13th - The Final Chapter also fell short of any other distinctiveness. It did little more than rehash the same story, as it tossed out characters and situations an awful lot like those of the first three movies. The DVD presented mediocre picture and sound. Leave this one for Friday diehards.